CASTAway is a proposed M-class ESA mission that will launch a small (50cm diameter) space telescope on an orbit that will take it through the asteroid belt, where it will perform a spectroscopic survey of 1000s of asteroids and have close (~1000 km) flybys with 10-20 objects. The proposal also includes an option, should sufficient mass margin be available, to take CubeSat payloads for release at the asteroids. It is expected that there should be healthy margins once the performance of the Ariane 6.2 launcher becomes better known. 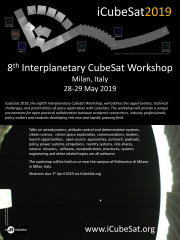 CASTAway is designed to explore the full diversity of the asteroid belt, with a trajectory chosen to visit as broad a range of asteroid types as possible, so presents an interesting opportunity for CubeSat experiments. CubeSats designed to make very close approaches and/or impact the asteroid could be considered. I will summarise the CASTAway mission and the expected constraints for any deployable CubeSats.